Beyond the visible world is a framework that holds everything together. The blueprint of life, that we rarely see, yet it is omnipresent. 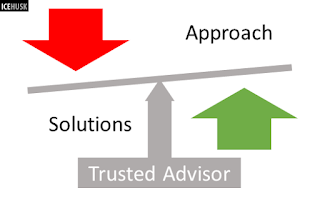 What makes us Trust a Trusted Adviser? Where there is a solution there is always selling involved. Funnily, even if there is no obvious problem to solve sales is pushed. In my opinion, a Trusted Adviser is someone who provides an Approach to identifying the opportunities or problems that the customer does not see yet. Thereby, may provide approaches to Capitalize on this opportunity or fix the problem. The approach may involve the necessary solution Options and selection criteria but without actively selling any particular solution. The moment selling comes into play the credibility as a Trusted Adviser is lost. 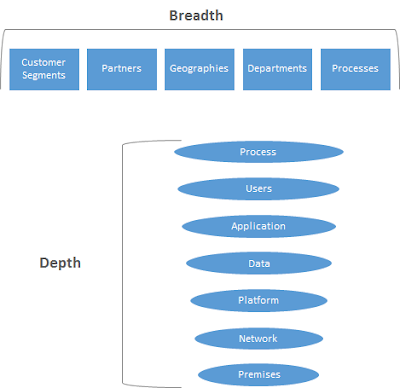 At the same time advisory may broker an internal team or an ecosystem to come up with a customized solution for the customer based on the discovery; focus as far as the customer is concerned remains on the Value Realization. In my previous post Complexity impedes Security I covered the simplification principles. The Cyber-Physical interactions are the focus in this post. The Physical-space comprises the geographical locations and the users and the tools in them orchestrated within a business process context. The Cyber-space comprises the Network that provides the connectivity, the Platforms that provide containers for the Applications to run on hence process the Data. 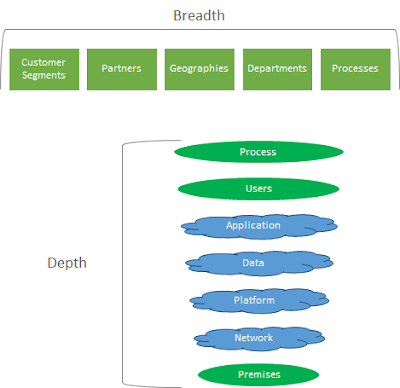 Enterprises operate their businesses across the breadth and depth of their capabilities using internal and external entities that share each others’ physical and cyber space. E.g., an Order Processing system illustrated here has a Payment Processing Team operating from Vietnam, an Order Processing Application accessible over the extranet (to employees, partners and customers) and a product catalog hosted on the Cloud.